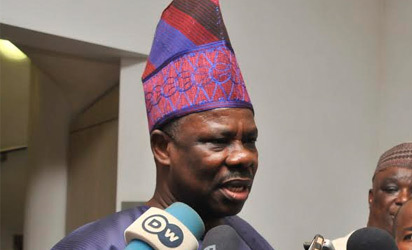 ABUJA—THE All Progressives Congress, APC, yesterday, accused Governor Ibikunle Amosun of Ogun State of sponsoring thugs to pelt President Muhammadu Buhari and other dignitaries during its campaign rally in Abeokuta on Monday. This was as the party asked its supporters to vote for only its candidates, a departure from the Presidential admonition to them to vote candidates of their choice after the presidential elections. Similarly, following the stoning incident that happened on Monday at the MKO Abiola stadium, the Inspector General of Police, Mohammed Abubakar Adamu has ordered the redeployment of Ogun State Commissioner of Police, CP Ahmed Iliyasu. President Muhammadu Buhari had at the Monday rally, in an apparent attempt to calm frayed nerves, told the supporters at the rally to follow their hearts, saying it was within their democratic rights to so do. Buhari said: “I advise you to practice your civic right come next Saturday, and on the 2nd of March to choose whoever you like across the parties. This is your right, so there is no problem about it, I have no problem about it, and you shouldn’t have problems about it”, the president had said, deviating from the tradition of canvassing support for all candidates of the party, being its chief campaigner. However, the party hierarchy, yesterday, in a strongly worded statement by its spokesman, Mallam Lanre Issa-Onilu, differed with him, telling its supporters to vote for “all and only” APC candidates. “The All Progressives Congress, APC, regrets Monday’s premeditated attacks sponsored by Governor Ibikunle Amosun on President Muhammadu Buhari and other senior party leaders at the venue of the presidential campaign rally in Ogun State. “The APC will not condone acts of indiscipline, indiscretion and anti-party activities from any party member no matter how highly placed. Meanwhile, Vice President Yemi Osinbajo has tackled Governor Amosun over his comments at the APC rally in Abeokuta, urging the electorate in the state to vote for the APC candidates all through. Osinbajo said this during a town hall meeting held at the palace of the Ebunmawe of Ago Iwoye area in Ijebu North Local government, Oba Abdulrazak Adenugba. The Vice President spoke 24 hours after APC and Allied People Movement, APM, caused chaos at the Presidential campaign in Abeokuta. He said: “Vote for APC alone on all the elective offices because, we don’t know of those who are meddling or promoting another party because anyone caught in such act can be described as bad cutlasses. “Vote for APC alone in all elective offices, remember a cutlass should have only one sharp edge. Anything short of that makes such cutlass a bad one. Meanwhile, a new Commissioner of Police has been appointed for Ogun State. He is CP Gbenga Adeyanju. CP Adeyanju was a former Commissioner of Police in Ondo State. A top Police source confirmed the redeployment, saying supporters, who thronged the stadium with missiles and objects, ought to have been prevented from entering the stadium with such dangerous objects by the Police. In a related development, the APC in Ogun State has apologised to President Buhari over the violence that marred the presidential rally held on Monday in Abeokuta, in which many members of the party were pelted with stones. In a statement by the Publicity Secretary of the APC’s Caretaker Committee in the state, Mr. Tunde Oladunjoye, said: “The Ogun State Caretaker Committee led by Chief Yemi Sanusi tenders unreserved apology to the President and Commander-in-Chief of the Armed Forces of the Federal Republic of Nigeria, President Muhammadu Buhari over the gross misconduct, indiscipline, disrespect and disorder perpetrated by agents of Governor Amosun today at the MKO Abiola Stadium.